Dalrymple also agreed that the default setting was the "best choice" since he imagines all the apps he uses will be signed by a Developer ID. "Using this setting I can download apps from a developers Web site and install it without any issues, but still be safe," he said. Though the number of malicious applications on the Mac OS X platform still pales in comparison to its long-time rival Windows, the rising sales of the Mac have begun to negate the argument that its small market share would keep it safe from threats. 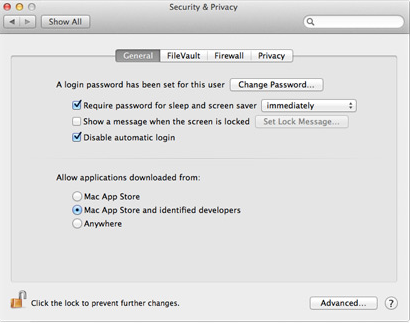 According to one analysis from last month, Mac OS faced 58 malicious software threats during the last three quarters of 2011.